As previously mentioned, we went to Daiso last Saturday to get a kitchen sink filter because we can't find this particular item that fits our kitchen anywhere. Daiso sells household items, gifts, stationeries, and snacks (gums, cookies, biscuits) made in Japan for $2 dollars in Canada. I believe in Japan the price is set to 100 Yen and $2.80 in Australia. 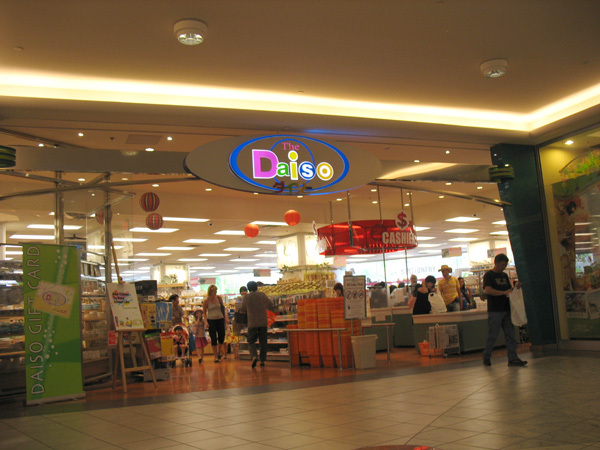 It's similar to a Dollar stores all across North America but we find Daiso's items are better in terms of quality and presentations. NOTE: There may be some items with higher prices but they are rare. It's been a while since the last time we went here to get stuffs due to the distance and the brutal parking entrance of Aberdeen Centre. From our last visit: a few ornaments, cutlery, and tools for my own use for my previous office. Grip Ball to reduce stress. As a software developer, numerous times I have to deal with annoying bugs. Fake flowers to make my desk a little bit more "humane" as opposed to cold and hi-tech. Let's not forget the "Fun" mug as well. We picked up a free Japanese-themed magazine out of curiosity because the cover suggested that it is covering Ramen shops around Vancouver. Been to both ramen shops in the past, ended up liking Motomachi because it is more enjoyable (less punishable as opposed to the heavier pork broth of Kintaro). Daiso seems to carry items for Valentine's day as well, care to buy your love one cheap $2 items? Guess so. The advertisement below is a little bit NSFW and caught us off-guard for a while. Good for laughing if you can figure out why. Deep Fried Intestines for Valentine's Day? Really? That's not a typo or wrong picture. By the way, we don't know the type of the animal where that thing come from. Perhaps it is common in certain culture to celebrate Valentine's Day by eating such dish. We didn't buy much this time around: cotton buds, shower cap, drain net. Came across a gum with Doraemon, a gadget cat from the future, themed that brought back our memories when we were kids. Taste like a soda gum, pretty good but the taste was gone after a few chews. Probably for the better of your tooth. We watched Doraemon when we were kids but at some point it was just re-run after re-run. Nobody knew how it ends. I managed to find what looks like the popular clip of how it ends on YouTube but I can't clarify if it is the official ending or a fan-made popularly-voted ending. Looks like Doraemon ran out of battery and not able to function for years until Nobita fixed it. I appreciate some of the Japanese cartoons growing up back then because they have good storyline, good message to send to the audience, targeted to kids, and full of creativity and imagination. The western cartoons were all about patriotism (G.I. Joe) and macho-ism (He-Man), but watched them as well since kids were easily mesmerized with cartoons somehow.